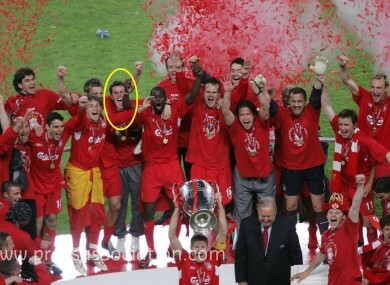 Finnan was part of Liverpool's 2005 Champions League-winning team. THE WHEREABOUTS OF Irish footballer Steve Finnan have been the subject of much curiosity of late. The former full-back is the only member of the 2005 Liverpool squad who won’t be turning up for an upcoming event to commemorate the 10th anniversary of the club’s Champions League win. The news prompted plenty of speculation about Finnan’s current location, with the #findstevefinnan hashtag prominent on Twitter. Steve Finnan is the only player to play in the World Cup, Chmps Lge, UEFA Cup, Intertoto, all 4 levels of English football & the Conference. “I gather that Steve’s living in London these days, playing a bit of golf and genuinely not interested in seeking a post-football media career unlike so many of his former colleagues. Email “The Steve Finnan mystery appears to have been solved”. Feedback on “The Steve Finnan mystery appears to have been solved”.